What do Robert Downey Jr. (actor), Graham Norton (TV show host), and David Blaine (magician) all have in common?1 They all share their birthdays, not only with each other, but also with the carrot – as today (4th April) marks International Carrot Day! So what is it about the carrot that makes it so great? Firstly, they are versatile – being used in both sweet and savoury dishes. Carrot cake being the most well-known ‘sweet’ recipe. As for savoury, you don’t even have to cook them – they make the perfect accompaniment to humous and other dips, and can be grated and added to salads. But even if they are cooked, there’s still lots of possibilities – mashed, roasted, boiled, steamed, or for those who may be a bit fussy, you can even disguise them by grating and putting them in dishes like spaghetti bolognaise and cottage pie –this is a great way to help achieve your 5-a-day! Secondly, they can be grown in the UK. In fact, 700,000 tonnes of carrots are produced here each year3. In November last year, the British Dietetic Association launched ‘One Blue Dot’ – an environmentally sustainable diet project. One component of this includes eating more locally sourced and seasonal foods4. So if you buy carrots that are grown in the UK, or if you are able to grow your own carrots, you’ll be contributing towards this goal. Finally, they are good for you – an 80g portion (approx. 3 heaped tablespoons) counts as 1 of your 5-a-day5. 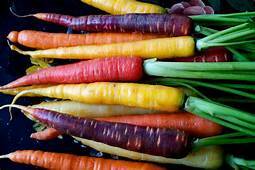 Carrots contain beta-Carotene (β-Carotene), which is converted to vitamin A in the body8. In the UK we are recommended to have 700µg (men)/600µg (women) of vitamin A each day6,but we need approximately 6 times more β-Carotene because it has a lower bioavailability. Luckily, a portion of carrots can provide this (and more)7. Vitamin A has a few important functions in the body, but one of the main functions that people associate with eating carrots is its role in our eye sight. If you have low levels of vitamin A (deficiency) you are more at risk of night blindness, which if left untreated can lead to complete blindness8. So there is some truth in the saying ‘eat your carrots – they’ll help you see in the dark’ but only if you have low vitamin A levels to begin with, so it is important we all eat foods like carrots which are rich in β-Carotene, to maintain vitamin A sufficiency and prevent deterioration in our vision. If you too are a fan of the carrot, why not join in with International Carrot Day celebrations, and have a Carrot Party – you could use our recipe to make your own Carrot and Walnut Cake to share with your guests.